The American broadcaster built a genuine grudge out of a contrived claim. Millions of fans lapped up the intrigue. The world's two premier sprinters toed the line in Toronto to settle a score that should never have been in dispute in the first place. Costas had ignored an unwritten rule of sport: whoever holds the lowest time in the men's 100 metres is the fastest person on earth. Period. The rule never needed writing because 100m runners hit the fastest speeds. But when the 1996 Atlanta Games rolled around, it was not a good year for American men in the 100. As host of NBC's Olympics coverage, Costas opined that American Michael Johnson, who ran to gold in a world-record 19.32 seconds in the 200 metres, was actually faster than Canada's Donovan Bailey, who set a new 100 standard of 9.84 seconds and also anchored the Canadian 4x100 relay team to gold in Atlanta. The glib math was that 19.32 divided in two equals 9.66. But even the most biased track fan knows that the second leg of a 200 begins with a sprinter in full flight. When Bailey caught wind of Costas’s pot-stirring comments, he was quick to call out "a person who knew nothing about track talking about it with a lot of people listening." Still. Bogus math notwithstanding, the idea had been unleashed in the track world. A seed of doubt had been planted. Maybe, despite the raw fact of Bailey’s unequivocally faster top speed, there was a race to be run at a distance somewhere in between Johnson’s 200 and Bailey's 100. Maybe that would answer the question that should never have been posed in the first place. World-class sprinting comes with rewards. Money. Fame. Adulation. But maybe one of the most important rewards, even if it is intangible, is respect. 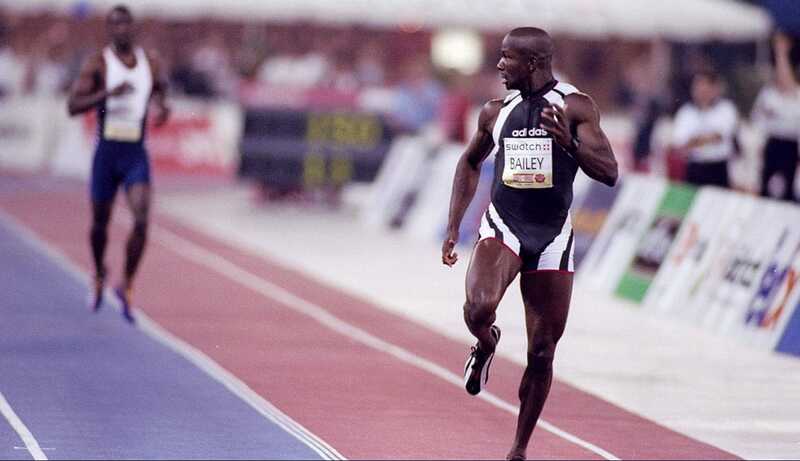 In 1996, Canadian men, anchored by Bailey, ruled the world in the 100-metre events. Bailey got all the measurable rewards that were his due for winning both the 100 and 4x100 gold medals at the Olympics. And yet, The Associated Press, the American news organization, named Johnson’s 200-400 double in Atlanta the story of the year. Bailey got zero votes. Then Sports Illustrated made Tiger Woods its Sportsman of the Year, shutting track out altogether. Bailey knew he was the fastest man on earth. What else did he have to do to prove it? The dispute over the "world’s fastest man" was afoot. Ideas about staging a big-ticket 150-metre race were bandied about in North America. But in the months following Atlanta, both racers had other fish to fry. They headed to Europe, track’s holy land, to compete in IAAF-sanctioned meets. Which is not to say either of them turned down the heat under their simmering feud. By the end of August 1996, Bailey and Johnson were in a shouting match at the Internationales Stadionfest meet in Berlin. But zingers were not going to settle the matter. Plans for a 150-metre event started to take shape. Oddly enough, the winning bid came from a little Ottawa crew that was mostly in the business of doing corporate motivational speaking. Magellan Entertainment Group made it official in November 1996: The One to One Challenge of Champions would pay $500,000 each to Bailey and Johnson for showing up at Toronto's SkyDome on June 1, 1997, with the winner pocketing an additional $1 million. The race buildup yielded a bumper crop of hype and patriotism. Prime Minister Jean Chretien picked Bailey to win. So did NDP leader Alexa McDonough. Actually, so did 68 per cent of Canadians in a Toronto Star poll. Predictions for the outcome of the unusual distance were understandably split along national lines, but the international perspective on the coming contest was altogether haughty. Sweden’s Patrick Sjoberg suggested that only Canada would hold a stunt race like this. He was part of the undercard in that day’s events, beating American Charles Austin in the high jump. “This wouldn’t work in Europe, but when you get here to Canada it is like going back 50 years because no one knows anything about track and field,” Sjoberg said. James Christie in the Globe and Mail caught some of this attitude and speculated that it might even have fuelled some of Johnson’s snarkiness. “Maybe it’s resentment that he and Donovan Bailey will run a historic match race before an unsophisticated North American crowd… in effect casting their pearls before swine instead of being appreciated as superstars as they would be in Europe,“ Christie wrote. Amid the inevitable Canadian rallying around Bailey, some track insiders praised Johnson for the attention he brought to the sport. Ato Boldon of Trinidad and Tobago, who ran to bronze in the 100 and 200 in Atlanta, was a big supporter. Boldon dismissed those who said 150 metres was not a legit distance. He argued that the race was good for the sport. We asked Bailey and Johnson to talk about the One to One Challenge for this story. Johnson did not respond, but Bailey says he understood, better than anyone, that track was more keenly watched overseas than here. Magellan Entertainment Group was overwhelmed by the demands of the race. The scheduled undercard events suffered a bunch of late no shows. Bills were in arrears all over town. The whiff of total cancellation was in the air, and a last-minute bailout was needed to keep the June 1 event on the rails. And all the while, the hype and posturing kept building. For a one-off race in Canada, an unheard-of crowd of 30,000 showed up at SkyDome. CBC Sports writer and researcher Mike Dennis, who has a steel-trap memory for sport minutiae, was in the building, working the broadcast that evening. He remembers the place being electric. The months of trash talk had definitely juiced the atmosphere in the stadium. The crowd overwhelmingly was backing the hometown favourite. Track purists recoiled, but organizers were already on unproven ground, so why not book the Blues Brothers to pump up the crowd for an opening act? The place was bouncing. It was like monster trucks or the Flaming Lips were performing. For a track event, it was all kinds of crazy. And too much for IAAF president Primo Nebiolo, who said, "This is not sports as entertainment, but more like something out of a circus. And we're not interested in it." Canadians, though, were rapt. Two and a half million tuned into the CBC broadcast. As the seconds ticked down before the gun went off, tens of thousands of fans in the dome were rhythmically chanting "Bai-LEY! Bai-LEY! Bai-LEY!" It was a stunt, and a hype machine, and the matter of who was the fastest person on Earth was never going to be settled in a one-off race around half a track curve over an unprecedented distance. But when it was go time? Johnson and Bailey were fully, completely committed. There were no smiles. No pre-race nods or fist bumps. The grudge was real. There was a million bucks up for grabs, back when that could still buy you a fancy house in Toronto, with enough change to keep a Lambo purring in the driveway. But most of all, there was respect on the line. TV commentator Geoff Gowan worried that a fair start might be jeopardized because the fans were making such a racket. The starter would have wanted and expected some hush as she called the men into the blocks. Bailey lined up in the red inside lane, with Johnson staggered a couple of metres ahead in the blue portion of the Mondo surface. In the lead-up to the race, Bailey was surrounded by voices saying he should not run. He was risking losing his legitimate claim to being the world’s fastest man, they said. Were there any doubts, even the smallest grain of concern, as Bailey took his mark? “No chance. I was going to win," he says now. "The bottom line for me was the economic opportunity and to run new distances — literally to make it like a new product in the track and field market. They were both out of the blocks cleanly. Starting on a tight curve, the conventional wisdom was that if Bailey would struggle against Johnson, it would be on the bend. But three seconds into the race, Bailey was moving beautifully. He had made up the stagger and was neck and neck with Johnson. The crowd was shrieking, and for a heartbeat there, this was a barn burner. A fantastic moment in the Canadian-American sports rivalry. A second and a half later, Bailey was in front. Another second and change, and he had a full metre on Johnson. The straightaway stretched out in front of them. Bailey was definitely leading, and increasing his lead, when Johnson, stunningly, pulled up. The entire audience was aghast. At 110 metres, Johnson hopped to a stop, favouring a quadricep, and his race was over. Bailey, running on full adrenaline, streaking toward the finish, had a clear sense that Johnson was no longer in the picture. In the final second, with victory assured, he looked back over his shoulder and made a "Come on! Hurry up!" hand gesture at his dejected, collapsed opponent. Bailey ran 14.99. He earned $100,000 a second during the race. The crowd was shouting like it was a Beatles reunion. In the immediate aftermath, before Bailey had a moment to get his raging race mode in check, CBC’s Mark Lee held a microphone to his face for comment. “There was never any doubt in my mind that I was the fastest man on the planet and this just proved it," Bailey said. "They said I couldn't run a corner, but I always said this is exposing Michael Johnson and the weaknesses in his race..."
World's fastest man? Certainly. But we knew that already. Most gracious victor? Jury is still out. In the post-race news conference, Johnson was asked about Bailey's "chicken" taunt. "That's saying a lot about what kind of person he is," Johnson said. "I'm going to show you what kind of person I am. I'm not going to address that." Twenty years later, Bailey considers a question: How much of that public grudge was just show business? “Well, it was a battle of testosterone," he says. "I don't know Michael. He and I have never gone out to dinner. Never had a beer. But he is a good dude. Certainly it's a guy who has etched his way in the history books as one of the best speed endurance guys in the world. I don't dislike Michael at all. I think there was a dislike, but you know that's what happens when you have two people at the height of their career. "You know what's great about it? I can only look at it from a Canadian perspective, that it was like a great hockey fight. And so Canadians loved it because, it was like, they are going to throw it down now. They are going to drop the sticks!… Not only did I drop the stick but I came up winning. And so Canadians were like, Yeah! Take that!" Fifty-four countries broadcast the race, which we can only hope puts it ahead of Michael Phelps versus the shark. Because for all the oddity of the 150-metre challenge, it was a real race, and respect and reputation hung in the balance. Bailey does track analysis on TV now for CBC Sports, and we wondered if he had ever had occasion to chat with the broadcaster who started all this? Speaking of cool, did Bailey buy himself a little treat with that million-five? “I was responsible,” he insists. Come on. There must have been something. “I chartered a plane and brought all my friends to a concert in Jamaica," he admits. "It was like a Reggae Sunsplash concert.